While I’m beyond excited to experience my first Northeast autumn in three years, I’m always a little bit sad to say goodbye to summer. This week’s heat wave aside, it’s been a pleasantly warm July and August filled with lots of time spent outdoors. 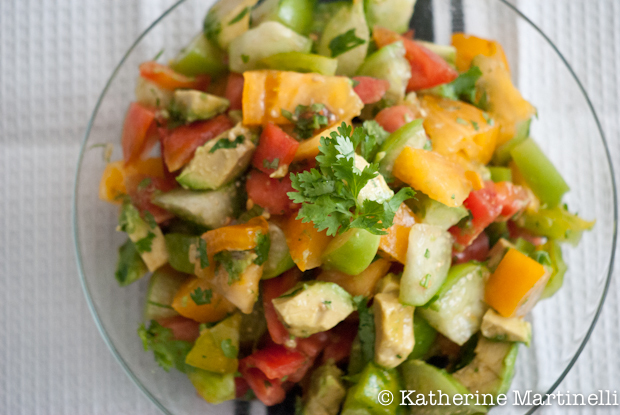 In order to have one last hurrah with some of summer’s best produce, I made this simple but incredibly tasty heirloom tomato, tomatillo, and avocado salad lightly dressed with olive oil, lime juice, cilantro, and salt. Have you ever had a tomatillo? I’ve tasted it plenty of times in Mexican salsas, but I can’t recall just slicing up a tomatillo and eating it raw. And why not?! They are absolutely delicious. Somewhat like a tart, firm tomato they’re simply bursting with flavor. Of course I can’t stop my association of tomatillos with Mexican cuisine, which is why it felt natural to include cilantro, lime, and avocado in the salad. The mix is light and refreshing and is delicious on its own, on top of crostini, spooned over chicken or fish, or as a chunky salsa. 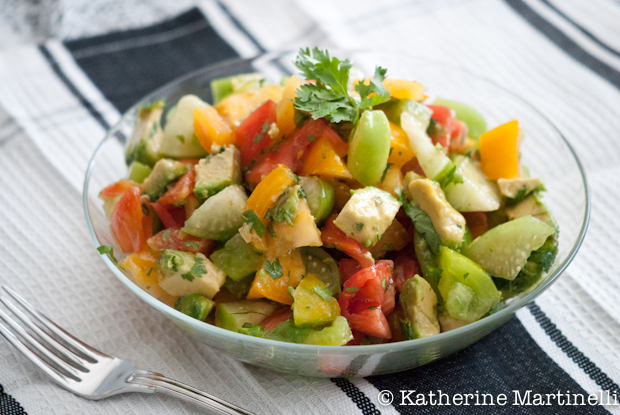 This simple heirloom tomato, tomatillo, and avocado salad recipe takes advantage of the last of fabulous summer farmers market produce. It's delicious on its own, on top of crostini, spooned over chicken or fish, or as a chunky salsa. Put the tomatoes, tomatillos, avocado, and cilantro in a bowl. Drizzle the lime juice and olive oil and toss to combine. Season with salt and garnish with additional chopped cilantro if you like. Serve immediately, or refrigerate overnight (the avocado will become slightly discolored but the taste will still be fantastic). i just used tomatillos for the first time cuz they looked too good at the market! made a simple enchilada sauce, but def want to try this salad! Wow! I need to visit your blog more often! Lots of great recipes and love your photos! Thanks for letting me link up! I LOVE end-of-summer stuff (I think it’s actually a little disheartening that everyone seems to have skipped right over into fall… everywhere I look are pumpkin recipes, already! ), so it made me super happy when I saw today’s theme. Thanks for hosting another great blog hop! 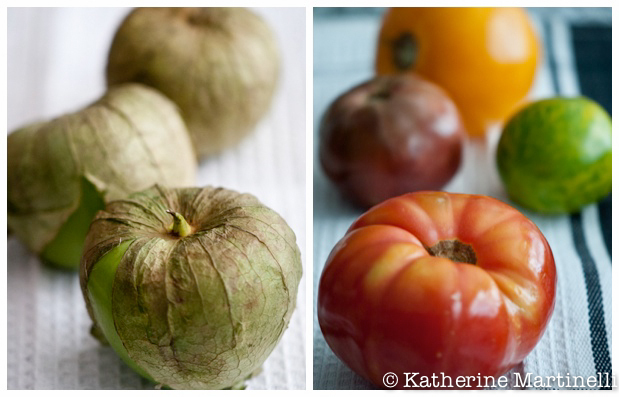 I love tomatillos, too! And I also almost always associate them with Mexican cuisine. Which I love, just as I love the flavors you’ve put together here. We’ve finally outwitted the squirrels who have got most of our August tomatoes, but now are getting some in September, including a few heirlooms. So I have plenty of ingredients on hand for this salad! Looks great – thanks. I only ever use tomatillos roasted but may have to give them a go raw next time! Can’t wait to hit the markets on Saturday!!! Oh I do love tomatillos and love mixing them in with fresh heirloom tomatoes, but I’ve never thrown in any avocado. That sounds perfect! Great salad! Thanks for the blog hop! I usually cook them so I’m not sure I’ve ever had them raw … I think this may be the perfect salad to try that with! Your salad sounds fabulous, and is gorgeous! Thanks so much for hosting and have a great week! I have been trying to recall if I have ever had tomatillo before, seems as if I didn’t. If I ever get a hand on tomatillos, I ll try your salad first. A last kiss to summer…I love it! And, I have Tomatillos in my fridge, so this just jumped to the top of the list. Thanks for the fabulous recipe, as always! Never tried tomatillos fresh. This looks crazy good! made this for my book club recently. It was a big hit..so colorful and flavorful!! So happy to hear it Roberta!! Made this recipe at home. It was great. Will now offer it to my clients.